Get in touch and share what type of TV (Plasma, LCD, HDTV, etc.) you own. 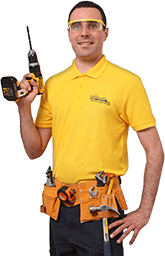 We will then confirm your appointment and dispatch the right handyman for your needs. A trained and experienced technician will arrive to carefully unpack the contents of your box and help you pick the optimal location for your brand new TV unit. The professional will securely mount your TV to the wall with either stock or custom (multi-positional, flat-to-wall, tilt & swivel, etc.) wall mounting brackets. 4.Sit back, relax, and enjoy the show! Your Fantastic TV installer can hide all cables from view inside plasterboard/brick walls or within D-Line trunking to help you achieve the ultimate cinematic experience. Types of walls: brick, stud, plasterboard, masonry, concrete and partition walls. *Customer should provide the TV and TV mounting bracket prior the service. Wall must be solid/sturdy, allowing the handymen to mount the TV without any additional reinforcement. Power and aerial sockets must be within 1 meter range of the mounting location. - To give you a fixed price we need to know the size of your TV and the type of wall it will be mounted to. For plasterboard walls first we inspect the wall to see if it can hold a TV. The wall can be reinforced with wood and then the TV is mounted on the wood. - You can get this service with a discount. Join the Fantastic Club for just £59 a year and take advantage of all the amazing benefits available for members. You get discounted rates for our entire range of services, special seasonal deals, and priority booking for the most requested time slots of the week. It’s great if you have multiple homes or if you manage several properties as you can save hundreds of pounds in a year. Do I need to supply you with TV wall brackets? Yes, you should. Usually, your TV manufacturer will include these inside your product’s packaging. In case they aren’t included, it would be best if you purchase the right model for your TV. Occasionally, we can provide the brackets for you if we know the exact make and model in order to avoid any complications. Keep in mind that their price will be later added to your total TV wall installation cost. Do I have to do anything prior to my handyman appointment? Having somebody else meet the professionals for you in case you are away. Where should my TV be wall mounted? If you’re unsure of where to place your TV, your television installer will gladly assist you with finding the optimal spot. There are 3 things to keep in mind here: the power outlet’s accessibility, the location of wall studs (used to properly support the weight), and the place where you want to sit while watching a movie. Also, a tilting or swivel TV mounts may be just the thing you need if you want better control over adjusting the view. Are my walls suitable for wall mounting a TV? Robust walls made of brick or concrete are just fine for your TV installation service. However, walls made of plasterboard or lath are not optimal for a TV wall installation as they may not be able to carry the weight. That is why your handyman will always inspect your walls first before performing the service. If you have plasterboard walls, the expert can reinforce them with wooden panels before mounting the TV on top. Can you mount different types of brackets on my wall? Just say the word and the experts will arrive with the right tools to mount your TV and safely conceal any stray wires to ensure your hazard-free, thriller-packed evening. The diligent specialists can install products by virtually any wall bracket manufacturer, namely: Sansum, Omnimount, Duronic, Vogel's, Ultimate mounts, Ross, VonHaus, Peerless, AVF, One for all, Proper, Sandstorm, Lumi, Meos and many more. Yes, absolutely. If you want to hide the cables in a brick wall or plasterboard, then we can chase them into the wall. Cable concealing is another way to get a tidy look. By installing plastic trunking, the specialists can hide the wires so they will be protected from damages. Will the handymen bring their own tools and equipment?